While the ageing of society has become one of the givens in today's world, less is made of the lived experience of the very elderly in society. And although there is some suggestion that the much trumpeted steady expansion of the human lifespan has begun to slow down, the numbers of very old people continue to grow. Despite this, debates about the resourcing of universal health and social care tend not to examine the costs associated with extreme ageing. Yet the problem of chronic conditions and multiple morbidity is greatest among octagenerians and nonagenarians. Very old age, if commented upon, is presented as if it were a kind of extreme sports competition. Centenarians are celebrated simply for reaching 100. Nonagenarians hit the news when they run a mile, climb a mountain or pilot a plane. Otherwise, silence reigns. Yet the focus of most social care is on people aged 80 and over - a group for whom care is needed because health cures have failed them. The morbidities and infirmities that beset the extremely aged are not so much ignored as abandoned to the efforts of medical services and social care. At UCL, we are trying to throw some light on this darker side of ageing. There are of course a number of ways that such "hyper-ageing" can be approached and understood. One view celebrates the fact that the more and more people can expect to live for 100 years or more. Another sees it as an apocalyptic disaster, as agedness "swamps" the resources of society needed to maintain itself. Yet another view juggles between the successes of more years of healthy active life and the failings of more years of living with disability and infirmity. Across the world, the burden of disease has been receding. But this is more the case for illnesses affecting younger people and those that are likely to lead to death, rather than disablement. By contrast, conditions that are degenerative and disabling more often than causing death remain largely unchanged. Rates of osteo-arthritis, for example, which disables but does not kill you, have been rising over the last 25 years (from 213*4 cases per 100,000 in 1990 to 232*1 cases per 100,000 in 2016). Rates for Alzheimer's disease, which disables more than it causes death, have also grown but in a less pronounced manner, (rising from 460*9 cases per 100,000 in 1990 to 470*6 cases per 100,000 in 2016). Although some chronic conditions affecting older people, such as chronic obstructive pulmonary disease, which kills and disables you, have been falling (from 1666*8 cases per 100,000 in 1990 to 945*3 cases per 100,000 in 2016), the really large falls in disease prevalence have been in conditions affecting the young, such as cases of diarrhoea and related common infectious diseases, which have dropped remarkably, from 8951*2 in 1990 to 3275*6 in 2016. In Denmark, one of the few national surveys of nonagenerians was conducted around the turn of this century. The researchers found that the majority contacted had some disability and that women were more often affected than men. The same researchers also observed that "about 10% of the octogenarians and more than 55% of the centenarians live in nursing homes, while dependency rises from approximately 30% to 70%, and the prevalence of dementia rises from approximately 7% to 50%". In the UK, one study of 85-year-olds found a median number of five diseases per person, with more than half suffering from hearing impairment, just over half from osteoarthritis, and just under half suffering from high blood pressure. Just under a quarter had some form of cancer. Less than 5% told the researchers that their health was poor: most said it was good. This last point emphasises how extreme ageing presents issues that easily go unremarked upon. Its problems are largely confined within the individual household or in long-term care institutions. Wider society scarcely acknowledges these problems and most of those on the receiving end, whether carers or people being cared for, are simply too overwhelmed to do much about them. Although not closed off to the public, the nursing home remains more present in the imagination than in most people's everyday experience. 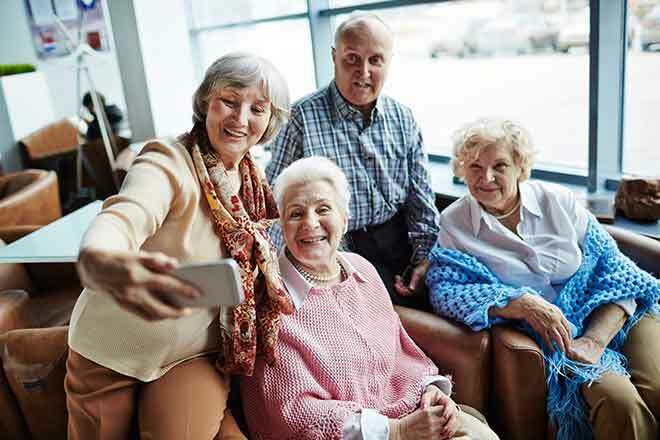 The social networks of the frail elderly, whether living at home or in a nursing home, tend to be so much smaller than those of the rest of the population. Most people over 80 live alone. They often have only a few people to talk with. Meantime, stories of abuse, or TV footage of the inside of the nursing home paint a grim picture to all who watch, read or hear them. These isolation and neglect of these spaces help preserve the distance between an "us" who are, if we are ageing, ageing well clear of such scenarios, and a "them", who are not. To be old and frail is not an identity to be acclaimed and the old and frail are generally unable or unwilling to represent themselves as such. For many of these people, life can be difficult. Estimates suggest that chronic pain "in people aged 85 years or older is common", affecting the majority of people from this age group. Aged lives of quiet desperation are sadly not rare, nor are most lived in the heroic terms of the marathon-running nonagenarian that hits the news.